Jack Skellington measures 10-inches tall and looks awfully real! Based on Tim Burton's stop-motion The Nightmare Before Christmas movie. The museum-quality bust is limited to only 1,000 pieces! Jack Skellington looks awfully real in this half-scale bust based on Tim Burton's acclaimed stop-motion film, The Nightmare Before Christmas. Measuring approximately 10-inches tall, the museum-quality resin bust is limited to only 1,000 pieces and comes packaged with a certificate of authenticity in a full-color box. 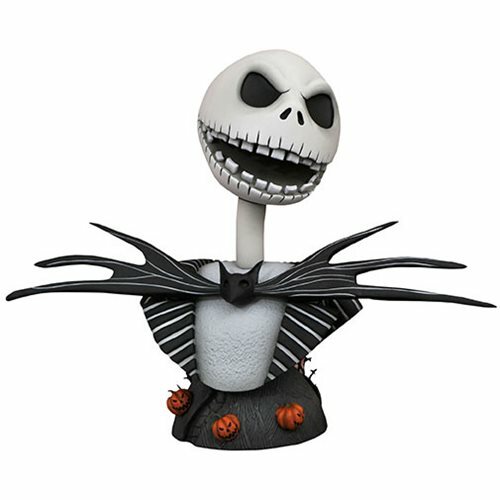 The Nightmare Before Christmas Legends in 3D Jack Skellington 1:2 Scale Bust is designed by Joe Allard and sculpted by Joe Menna.